Myself Sara Scales and my sister Kate Milton are who make up Minidreamz. 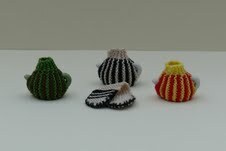 Between us our skills are quite eclectic, Kate is the knitter and I have a go at everything. My main areas though are cross stitch and bead work and am aiming to move into crochet. I also like to work in felt for mini toys, cushions and and christmas bits. All our products are hand made. We are brand new to the business side and have only done to fairs to date but we are now hooked. I am a contributer to Dolls House World magazine and recently have been given a monthly chat and project page. The first one of those is in this month coming (october edition). I have done my chat type page "Twelth Scales" yes I know its corny but it was their idea and also a cross stitch spooky castle picture and a trick or treat bag. Still waiting to see if they are going to use it all but i have been told I can have two pages. 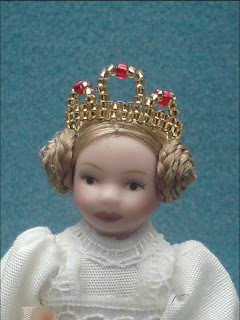 My Blog is minidreamz.blogspot.com This includes not just dolls house info. Enhorabuena por la publicación que tendreís en octubre.